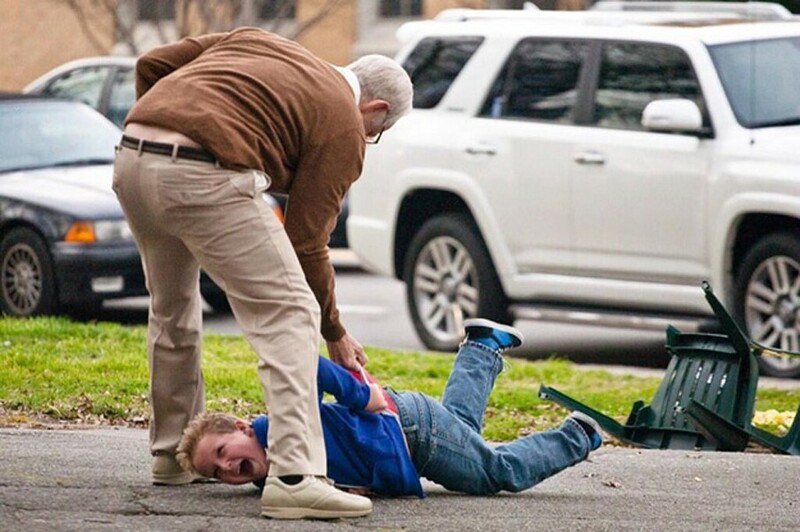 PHOTO COURTESY PARAMOUNT PICTURES Johnny Knoxville and Jackson Nicoll in "Bad Grandpa." After a three-season-long TV series on MTV and three feature films, it's a safe bet that by now you probably know whether or not you fall within the target demographic for a "Jackass" movie. The franchise's latest, "Bad Grandpa," finds the crew experimenting with the addition of an actual narrative to the formula of stupid human tricks performed with their standard disregard for personal safety. It's significantly less shocking than their previous exploits, but your enjoyment still largely depends on whether you're intrigued by the thought of an elderly man getting the most sensitive part of his anatomy stuck in a vending machine, or find yourself giggling at the following two words: projectile pooping. There's no denying that it's stupid, and no one is going to mistake it for great cinema, but I laughed. A lot. Johnny Knoxville, under pounds of prosthetic makeup, stars as the elderly Irving Zisman, whose wife, Ellie (Catherine Keener), has just passed away. Irving mostly sees this as an opportunity to get back to behaving badly: drinking, attempting to get laid, and generally acting like, well, a jackass, until his daughter shows up at Ellie's funeral with her 8-year-old son, Billy (Jackson Nicoll) in tow. Explaining that she's about to go to prison on drug charges, she needs Irving to drive Billy across the country and deliver the boy to his ne'er-do-well father. Being saddled with a young child is bound to cramp Irving's style, but it isn't long until the pair discover that they have more in common than either expected. Like Sacha Baron Cohen's "Borat" and "Brüno" films, but without the element of social satire, the humor in "Bad Grandpa" is derived from the incredulous reactions (captured through hidden camera) Irving and Billy evoke from the strangers they encounter along their journey. Those scenes are strung together by the barest thread of a plot (credited to director Jeff Tremaine, Knoxville, and "Jackass" co-creator Spike Jonze), as Irving and Billy slowly bond with one another. These heartfelt scenes strike an odd balance; they're competently performed and scripted, but everyone is clearly aware that the audience is waiting for the earnestness to end. Whether competing with male strippers or being chased by irate shop owners, Johnny Knoxville throws himself (often literally) into his role with his usual boyish glee. But it's Nicoll who's a real find: more than capable of holding his own against Knoxville, and nearly walking off with the entire movie.